10 minutes walk for Christchurch main bus/coach terminal, BreakFree on Cashel located in the centre of Christchurch, is a boutique hotel, offering modern ensuite stylish hotel double, twins and family rooms, with LCD smart TV, in-room movies, refrigerator and a private bathroom with dimmable lighting. It features 24-hour reception and on-site café and bar. Guests receive 500MB of free WiFi per day. BreakFree on Cashel is within 15 minutes’ walk of a vast array shopping and dining options. It is 500 metres from Christchurch’s iconic Container Mall and. Being 10 minutes walk to Christchurch main bus terminal, Christchurch International Airport is 35 minute by regular daily city to airport bus services that operate 7 days a week. BreakFree on Cashel offers express checkout, laundry services, and a range of meeting rooms. 12 minute walk to Christchurch's main distance bus/coach terminal, 10 minutes walk to Cathedral Square and next to the Restart Cashel Mall, the Ibis Christchurch is located near the beautiful Avon River and has 155 modern ensuite hotel rooms, each room featureing city views, a refrigerator, satellite TV and broadband internet access. Some hotel rooms have intimate meeting room for business guests. The Oopen Pasta and Grill Restaurant and Bar serves a variety of local dishes. The Ibis Christchurch Hotel is next to the Re-Start Mall in Cashel Street, 9-minute walk from the Canterbury Museum, Hagley Park, the Botanical Gardens and is 15 minute walk from New Regent Street. 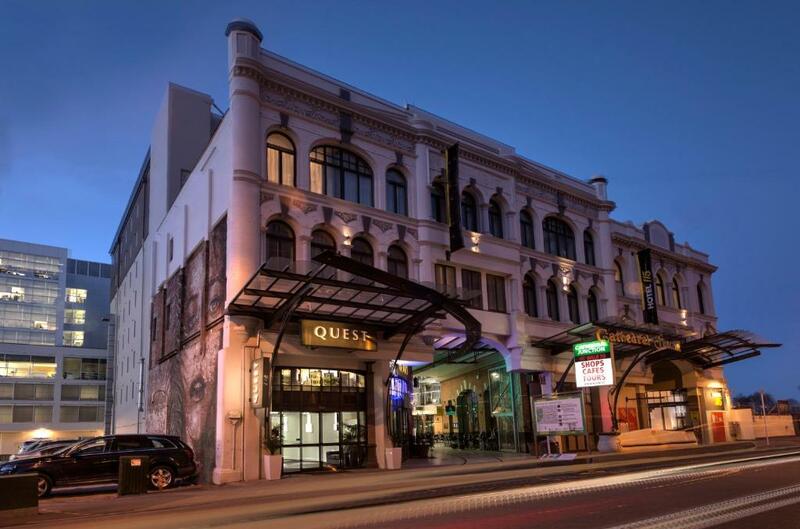 15 minute walk to Christchurch's long distance bus/coach terminal, 20 minute walk to the Restart Cashel Mall and 2 minutes walk to Cathedral Square, the Quest Christchurch has spacious studios and 2 bedroom self contained and well-furnished apartments. each apartment features a private balcony and a living area with satellite TV kitchens and laundry facilities. The studios have a kitchenette. For added convenience, Quest is within walking distance of several boutique shops, cafe and restaurants. 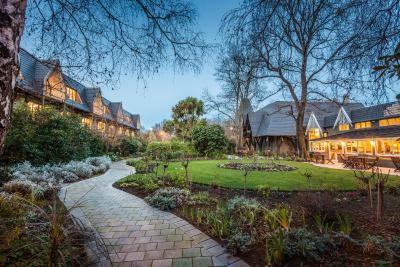 18 minute walk to Christchurch's long distance bus/coach terminal, 15 minute walk to the Restart Cashel Mall and 5 minutes walk to Cathedral Square, the Rendezvous Hotel Christchurch is a 4 star hotel with has hotel room and suite accommodations with city views and free Wi-Fi in public areas. It is a 12-minute walk from the Christchurch Casino. All rooms at the Rendezvous Hotel Christchurch have contemporary furnishings. Each one is fitted with air conditioning, work desk and tea and coffee-making facilities. Other facilities include a fitness center, business center, restaurant and bar. Guests receive free local telephone calls and free broadband internet access each day. Just 35 ft from New Regent Street, the Rendezvous Hotel has easy access to the Avon River as well as local restaurants and cafes. Christchurch Botanic Gardens is a 20 minute walk away. 15 minute walk to Christchurch's long distance bus/coach terminal, 12 minute walk to the Restart Cashel Mall and 2 minutes walk to Cathedral Square, the Novotel Christchurch Cathedral Square is a 4 star, contemporary hotel, with city views in all rooms. It is within walking distance of the Convention Centre and Hagley Park. There is a choice of modern rooms at the Novotel Christchurch Cathedral Square, all of them spacious and stylish. All rooms feature wireless broadband access and LCD TVs. Some have a separate living space and work desk. Novotel Christchurch Cathedral Square restaurant is open throughout the day, serving New Zealand cuisine and excellent wines. The hotel has a fully equipped gym. 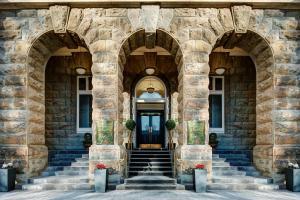 15 minute walk to Christchurch's long distance bus/coach terminal, 12 minute walk to the Restart Cashel Mall and 2 minutes walk to Cathedral Square, the Heritage Christchurch hotel is a 4.5 Star hotel restored Italian Renaissance-style elegant Old Government building, located in the Cathedral Square. The Heritage Hotel Christchurch has 1 and 2 bedroom apartments that are elegantly decorated and include a kitchen, dining area and lounge. Facilities include cable TV with cinema channels, private bathrooms, and laundry facilities. The hotel is 35 minute walk to Hagley Park, a green inner city oasis containing a golf course and botanical gardens. The unique Re:Start Mall is also within walking distance. The coast of Pegasus Bay is 5.5 miles from the property. Maddison's Restaurant provides a continental buffet breakfast each morning. 15 minute walk to Christchurch's long distance bus/coach terminal, 12 minute walk to the Restart Cashel Mall and 2 minutes walk to Cathedral Square, Hotel 115 is a 3.5 start hotel with has tastfully designed hotel rooms with private bathroom with a shower, a flat-screen TV and iPod docking station, a refrigerator and tea/coffee-making facilities. Guests receive 300 MB of free Wi-Fi per stay. 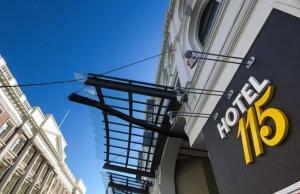 Hotel 115 Christchurch is a 3-minute walk from shops, cafes and restaurants. The tour desk provides information on local activities and there are restaurants nearby that can additional your meal costs to your accommodation bill. 20 minute walk to Christchurch's long distance bus/coach terminal, 7 minute walk to the Restart Cashel Mall and 11 minutes walk to Cathedral Square, Orari Bed and Breakfast is located in central Christchurch, a 3-minute walk from Canterbury Museum and 5-minute walk from the Botanic Gardens and Hagley Park. Housed in a refurbished heritage house built in 1893, Orari Bed and Breakfast has 10 ensuite guest rooms with electric blankets, plunge coffee, a selection of teas, flat-screen TV, heated towel rail, a hairdryer and free toiletries and free Wi-Fi access is available. Guest laundry facilities are available. Breakfast is served in the dining room, and it includes free range bacon and eggs. Guests can enjoy a free glass of wine every night. 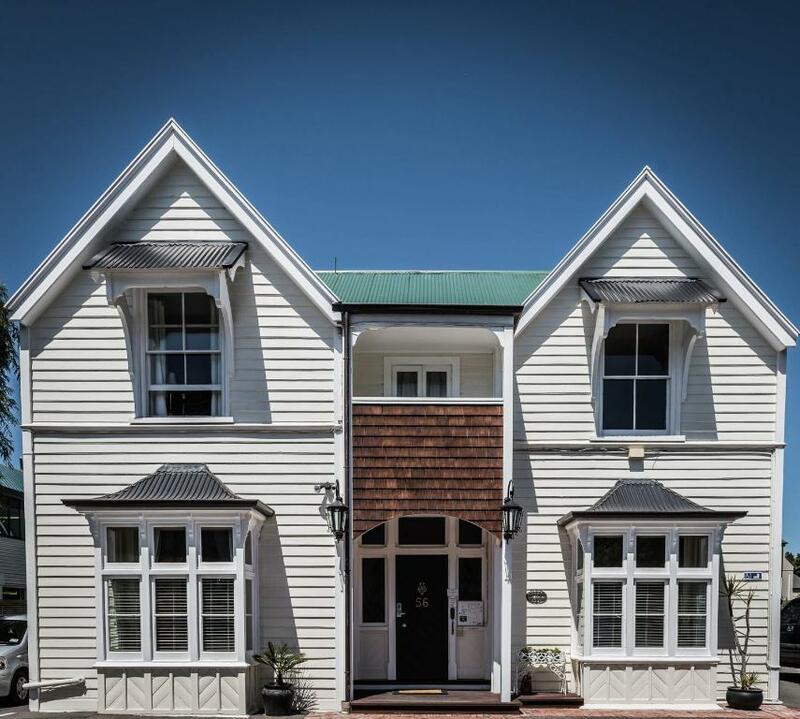 18 minute walk to Christchurch's long distance bus/coach terminal, 6 minute walk to the Restart Cashel Mall and 10 minutes walk to Cathedral Square, Grange B&B is housed in a Victorian mansion built in 1874. A 5-minute walk from the Convention Centre and Christchurch Art Gallery. The tastefully decorated ensuite rooms offer tea/coffee making facilities and a flat-screen TV with satellite channels. The ensuite bathroom comes with free toiletries and a hairdryerree Wi-Fi access. Laundry and dry cleaning services are on offer. On good days, guests can enjoy a barbecue in an outdoor garden setting. B&B Grange is a 5-minute walk from the Arts Centre and the Botanical Garden. New Regent Street is an 18 minute walk away. 18 minute walk to Christchurch's long distance bus/coach terminal, 6 minute walk to the Restart Cashel Mall and 10 minutes walk to Cathedral Square, Thomas's Hotel-on Hereford features free Wi-Fi, 2 guest lounges and a communal kitchen. It is located across from the Arts Centre, and 5-minute walk from the Botanic Gardens and Hagley Park. There is a guest laundry on site. You can enjoy a meal and relax in the lovely BBQ and garden area. All guest rooms are clean and comfortable. Some rooms feature private bathroom facilities, others provide access to a shared bathroom. The YMCA Christchurch has shared dorm, shared and private rooms, a fully-equipped fitness center with a racquetball court and an indoor climbing wall. Guests have access a restaurant, a cafe and a travel desk. Near the railway station and surrounded by 5 acres of peaceful gardens with a private vine yard, the Chateau on the Park is a 4 star hotel with 192 ensuite hotel rooms with heating, air conditioning, satellite TV and free Wi-Fi. The private bathroom features a bathtub, shower, hairdryer and organic toiletries. Guests have access to a golf putting area and bike rental. Garden Court Brasserie overlooks the garden and has open-air dining during the summer months. The Den Bar showcases an open fire, and serves drinks, snacks and light meals. Courtesy City & Railway Station transfers are available. 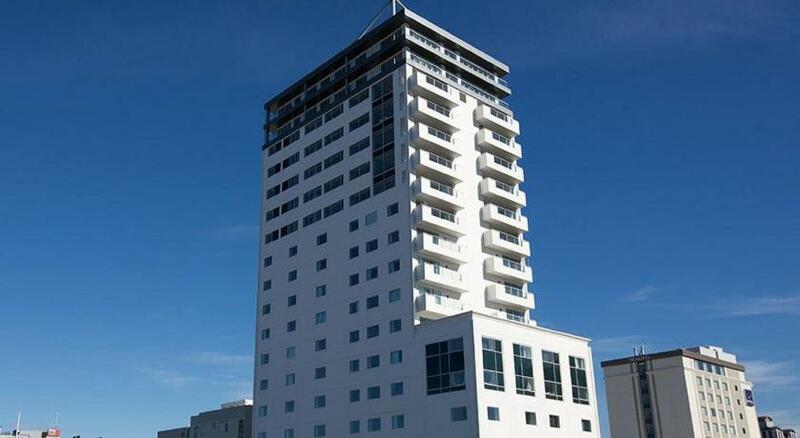 Just 900 metres from Christchurch Train Station, Tower Junction offers soundproofed studio, 1 and 2 Bedroom suits a private balcony or patio. It features barbecue facilities and a free shuttle service to and from the train station. 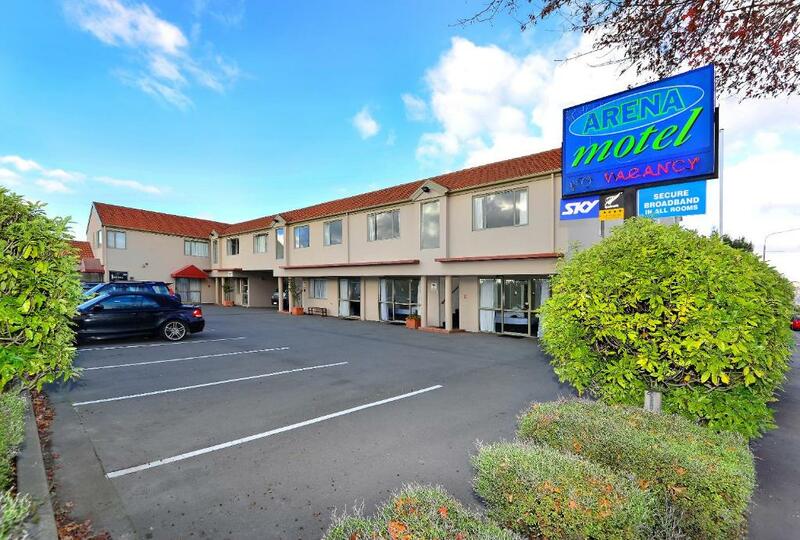 Tower Junction Motor Lodge is 5 minutes’ drive from CBS Canterbury Arena and 10 minutes’ drive from Christchurch Casino. Christchurch International Airport is a 15-20 minute drive away. A kitchenette with a microwave, refrigerator and toaster is standard in all apartments. Each air-conditioned apartment has a seating area with flat-screen satellite TV and a DVD player. Railway Station transfers are available. 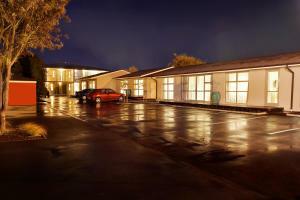 Central Park Motor Lodge offers modern, pet-friendly accommodations in Riccarton. Just a 5-minute drive from central Christchurch, it features a business center, guest laundry, barbecue facilities and room service. The studios and 1 and 2 bedroom suites are spacious and stylish. Each features a modern kitchen, an LCD TV with satellite channels and a DVD player. Continental breakfast can be delivered to the rooms. Wi-Fi access and free parking are also available. Central Park Lodge is just a 10 minute drive from Cathedral Square and from Christchurch International Airport. Free shuttle service to Christchurch Train Station is available upon request. Central Park Motor Lodge offers modern, pet-friendly accommodations in Riccarton. Just a 5-minute drive from central Christchurch, it features a business center, guest laundry, barbecue facilities and room service. The studios and 1 and 2 bedroom suites are spacious and stylish. Each features a modern kitchen, an LCD TV with satellite channels and a DVD player. Continental breakfast can be delivered to the rooms. Wi-Fi access and free parking are also available. Central Park Lodge is just a 10 minute drive from Cathedral Square and from Christchurch International Airport. Free shuttle service to Christchurch Train Station is available upon request.